A few weeks ago, with little to no fanfare, we passed the 500 posts milestone. It has been a wild and fun ride since late 2008. This blog is now up to 512 posts as of yesterday. Google tells me Bevlog has had 555,404 visitors and 832,024 pageviews so far, with an average of 44 seconds per session. The most popular posts are Tito, Blue Moon and Palcohol (with 37,587, 36,183 and 17,022 views respectively in the past two years). I am not sure whether the blog has led directly to any particular revenue, but it has put me on e.g., The Today Show and CBS News, and I don’t imagine any other (legal) way to accomplish that. Some of the posts are fun and easy, and take no more than a few moments (examples). Others, somehow, take hours and hours — even if they seem so simple beforehand. I am pleased to report that we’ve heard of no substantial inaccuracies so far, and we’ve had very few complaints. One big company oh so smoothly asked for a clarification. One multi-billion dollar organization demanded a change but settled for something approximating a change in punctuation. Along the way I met Tito, the Hatfields (and McCoys), and E-40. 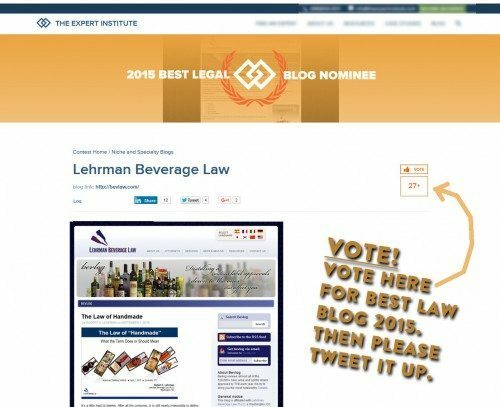 And now we are pleased to report we have been selected (from more than 2,000 nominations and tens of thousands of law blogs) as one of the best law blogs for 2015, by The Expert Institute. Please vote if you have not already. We don’t charge anything for this information. We don’t accept any advertising and we routinely turn it down. We do ask you to enjoy, comment, pass the word along — and if you think it’s really good, please consider voting for it here. We only have 27 scrawny votes as of this writing — and we are getting beat by “The Wedding Lawyer” of all people (at least we are beating the horse lawyer). My mom will be proud (if I don’t get beat by the Wedding Lawyer). Finally, thanks for reading and please let us know any great topics or ideas to make the blog better in the coming years. I just wanted to comment and say that I love reading this blog. I have no professional connection to beverage law (just a general interest in beverage trends), but there is so much interesting content in these posts. I would love to see an updated post on Kombucha, particularly the sale of GT’s original formula. Have there been any cases of open container laws? What is your take on the TTB’s policies on Kombucha? Wow thanks John. You made my morning. Good point; I will write more about kombucha soon. 500 posts…a nice milestone to reach. As with John above, I have no connection to beverages (except drinking them, heh), but I agree wholeheartedly this is a very interesting topic and one I like to check in on occasionally.